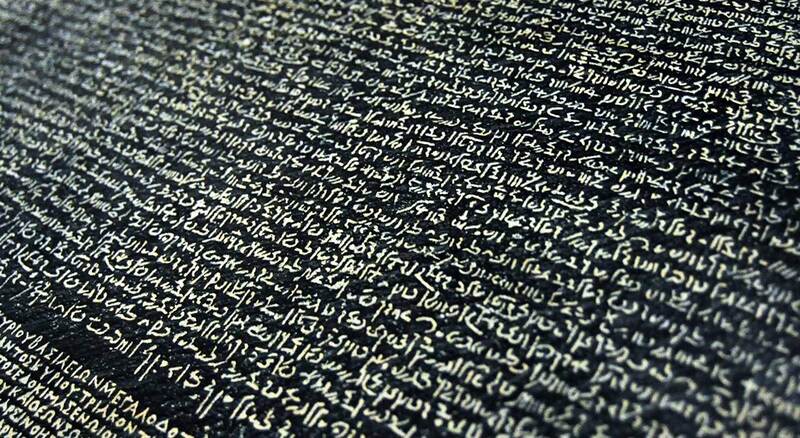 During the Ptolemic dynasty, Egyptian and Greek languages were used simultaneously. During the Roman Governorship only Latin was used and occasionally Greek. Within a hundred years the Egyptian hieroglyphics were no longer used or understood by anyone and even the Roman authors of the time suggested that hieroglyphics was not even a language. In the truest sense this is now a dead language. Ultimately the Roman Empire fell and the Middle Ages “came about”. Nevertheless, there existed a constant contact between Europe and Egypt such that hieroglyphics were consistently known by the European elite. The reason for this is that medical practices of the Middle Ages resulted in the prescription of bitumen, ground up mummies as a cure for various kinds of diseases. Thus, there was a trade in whole mummies which resulted in examples of hieroglyphics coming into Europe throughout the Dark Ages. The history of the deciphering of the Egyptian hieroglyphics during the 16th and 17th centuries took small steps toward final interpretation. Some scholars thought that the hieroglyphics were the origin of other languages. Some believed that hieroglyphics spelled nothing at all. Yet others believed that the hieroglyphics were an indication of social stratification or social significance. This speculation would have continued had not a political event interceded. The almost constant warfare between Britain and France resulted in a major change in the understanding of hieroglyphics. The French under Napoleon Bonaparte decided that they could defeat the British by attacking Egypt and subsequently controlling the rich food supply from along the Nile. In August of 1798, 13 French ships landed near Alexandria at Aboukir Bay in Egypt and marched inland to fight the British near Cairo. The night before the battle, Napoleon exhorted his troops on by saying something like “Soldiers, from the tops of these pyramids, forty centuries are looking down at you.” The French ground forces won the conflict but the British navy, under the command of Lord Horratio Nelson, defeated the French navy. Napoleon believed that he would be in Egypt for only a few months, but he and his men were stranded there for three years with no way to return home. Napoleon had brought with him between nearly 1000 civilians including 167 of whom were scientists, technicians, mathematicians and artists who studied the art, architecture, and culture of Egypt during their “extended vacation.” From 1809-1828, they published a 19-volume work called Description of Egypt. Their observations, drawings and illustrations were circulated throughout Europe and created a tremendous interest in antiquities of Egypt. The soldiers continued to “dig in” and they reconstructed forts as most soldiers had done during previous centuries by using building stones previously used by earlier peoples. In 1799, while extending a fortress near Rosetta, a small city near Alexandria, a young French officer named Pierre-Francois Bouchard found a block of black basalt stone. It measured three feet nine inches long, two feet four and half inches wide, and eleven inches thick and it contained three distinct bands of writing. The most incomplete was the top band containing hieroglyphics, the middle band was an Egyptian script called Demotic script (he did not know that), and the bottom was ancient Greek (he did recognize the bottom band). 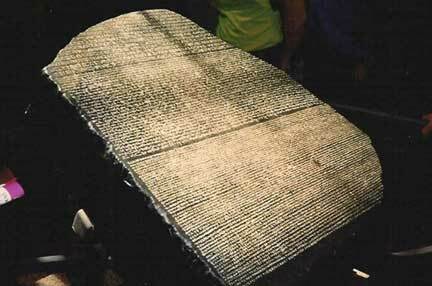 This stone was called the Rosetta Stone. He took the stone to the scholars and they realized that it was a royal decree that basically stated that it was to be written in the languages used in Egypt at the time. Scholars began to focus on the Demotic script, the middle band, because it was more complete and it looked more like letters than the pictures in the upper band that were hieroglyphics. It was essentially a shorthand hieroglyphics that had evolved from an earlier shorthand version of Egyptian called Heiratic script. Material from Egypt was continuously coming into Europe. In order to display their status, the European gentry and nobility normally had some Egyptian relics in their possession, perhaps an art object on a table or if one were quite rich, they might have an obelisk in the front yard of the estate. Material containing hieroglyphics continued to enter Europe at a reasonably accelerated rate.